I’ve removed the jargon from the Green IT Life Cycle and adapted it for the home. Understanding the life cycle will help you to do two things: reduce the negative impact your computing has on the environment, and save you money in the long term. Transportation is also a factor, because it takes place between each phase. Mined materials are transported for refinement and then on to factories. From the factory (perhaps in China, but almost certainly remote from where you are if you’re reading this in North America or Western Europe), your newly built computer, phone or tablet is then transported to a warehouse and a retail outlet, and finally to your home. If we add together all of the potential environmental impacts of these activities we can see that the energy used to power our computers once we’ve bought them is only one isolated factor in the bigger Green IT picture. The total carbon emissions involved in the Green IT life cycle are known as ‘embedded emissions‘. Socially responsible companies want to reduce these embedded emissions, and so should we. But as we’ll see, there are other environmental and even ethical issues involved for the conscious consumer of computing. Let’s go through each of the Green IT life cycle phases individually, note the environmental issues at each stage, and how we can challenge them. Different devices use different materials, but one estimate states that a typical PC and monitor contains at least twenty-seven different compound materials and that the semiconductor industry uses more than one thousand hazardous substances. Obviously, energy is consumed in mining and manufacturing which contributes to overall carbon emissions. But there are other issues: much of the mining and manufacturing is carried out in developing countries. Are workers fairly paid and treated? Are mining practices monitored for their impact on the environment? Are hazardous substances controlled? This is the most difficult stage of the Green IT life cycle for us, as individual citizens, to really understand and influence. But there are things we can do. However, there is no policy statement on the fair treatment of workers, an issue which has bedevilled Apple in the past. Nor is there any evidence or guarantee that these policies are being carried out – but at least it’s a start, and if we as consumers dig a little deeper, we can find a lot of detail about the working practices of the technology companies we patronize. Is it the right time to buy new? New computing devices are becoming more and more energy efficient. There comes a point when it makes sense to invest in a more modern PC or laptop. But remember that when you but the new device you are also buying its embedded emissions. If you are running out of storage or processing power, try to prolong the life of your PC by using cloud services such as Dropbox, Google Drive or Amazon Cloud Drive. Do I need the biggest and most powerful computer? This is where cloud computing services come in again. Over the next few years we expect a trend towards smaller, lighter and less powerful computers. Why? Because they can use the processing power and storage of servers and applications that are in the cloud. How can I choose the most energy efficient PC or other device? There are different standards across the world, but the EPEAT and Energy Star certifications are good places to start for Green IT purposes. How can I operate my computing equipment efficiently? There are a few good practices you can follow. First, use the power management facility of your PC to make sure you are conserving energy where possible. Second, always switch off computers when in use. After closing down, switch off at the power socket, as most power adaptors (and rechargers) continue to draw power even when the device is switched off or not attached. Also, make sure there is a good air flow where you are working so that less energy is consumed by your device in keeping itself cool. What about energy sources? An issue that big companies are addressing is the quality (and not just volume) of the energy they use. In the home, this equates to using energy companies committed to sustainable energy generation, or to using your own solar-powered energy generation. Reuse your old computer in your own home. If your processor and storage aren’t up to all the jobs you want it to do, you could use it just for a single task such as word processing or web browsing. Find a new home for your PC. There are lots of websites that have set up exchange schemes for old PCs. You can also try local schools and charities. 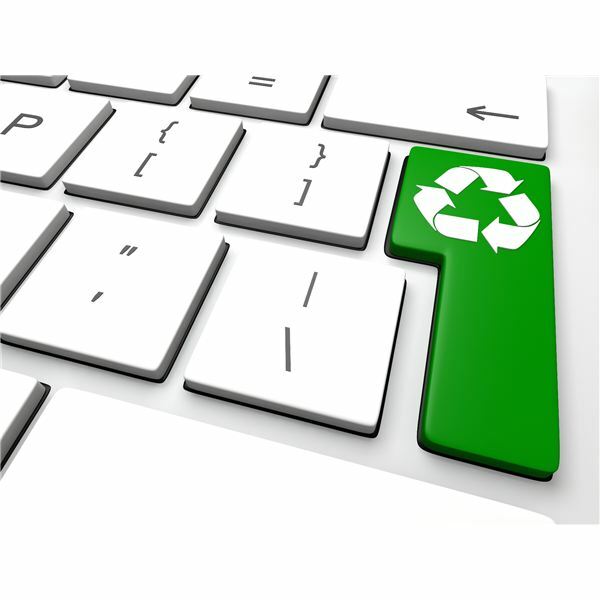 On the internet you can find hundreds of organisations who need old PCs or specialize in recycling them. Wipe your data before disposal! Make sure you have permanently deleted your personal details from your computer before recycling. See this resource for more advice. Use a reputable disposal facility. If all else fails, find a reputable disposal and recycling facility. Your local authority may have details of how and where you can dispose of electronic equipment. About the Author: Dan McCarthy writes about Green IT and Corporate Social Responsibility at About Green IT. He conducts business through Verax Consulting, has an MA in Social Anthropology, and plays guitar badly.